From a young age, your child sets store by his or her room. A child’s room is a haven and, if you play your cards right, a place that stimulates his or her creativity and sense of beauty. One of the most interesting ways of making your child’s room more beautiful and interesting is to make use of lights in your decoration. We’ll assume that you already know there are plenty of creative desk lamps, floor lamps, and night-lights you can buy. Accordingly, in this article, we’ll be exploring five especially original ways you can use LED lights in your child’s room. 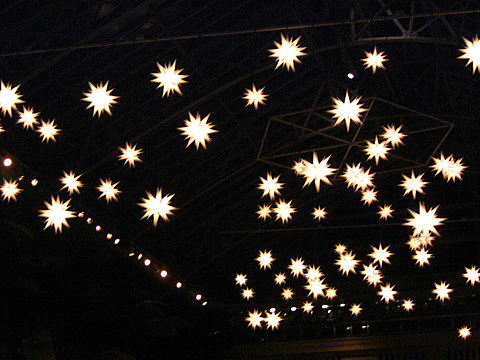 There are dozens of ways you can turn your child’s ceiling into a star-strewn sky. Some parents prefer glow-in-the-dark stickers or lamps with special domes. Those options work just fine, but they lack the visual appeal of two other options: specialized hanging lights (as pictured above) and embedded LEDs. If you have ceiling tiles, embedding simple white lights can create a stunning look that closely resembles real starlight. Using strings of lights with any sheer or semi-sheer cloth creates a beautiful effect. You can add a dash of magic to bed curtains, a canopy, decorative waterfall curtains, or even a cloth reading tent. When combining these two elements, there’s no limit to what you can do. Help your child feel as if he or she truly owns the room by stringing up lights in the shape of your child’s name. Rope lights from Christmas Lights Etc can help you put your child’s name on the wall. Plus, once you’ve had a chance to experiment with rope lights, you’ll find that there are no real boundaries to how creative you can be. You can add whatever other light-based words and images your little one will find appealing. By combining LED lights with specialized paper lanterns, you can create a cloud that glows a comforting white—or, if you prefer, that shifts between various dazzling colors: All hail the mighty glow cloud! Traditionally, glow clouds hang from the ceiling, but some models can be directly affixed to the wall. In either case, these clever lights mesh perfectly with any sky-themed room decor. All children are born as party animals. You can help fuel your child’s sense of celebration by turning a bedroom or playroom into a kiddie disco. Simply hang colored lights that flash in patterns, throw in a miniature disco ball, and turn on your child’s favorite music. Your child will be a dancing queen or king in no time! Whatever ideas you pursue, remember to put safety first: Choose shock-proof lights without toxic parts, and opt for LED lights — which stay cool all night — to avoid a risk of fire. When you keep those warnings in mind, the sky is the limit. Whether you choose your favorite concept from this list or use these ideas as inspiration for your own creative expression, your child’s room is sure to come alive with originality in no time. This entry was posted in Interior and tagged Child’s, design, lights, Room. ← Want To Know The Legal Processes Involved in LGBT Divorce Cases? Read This!